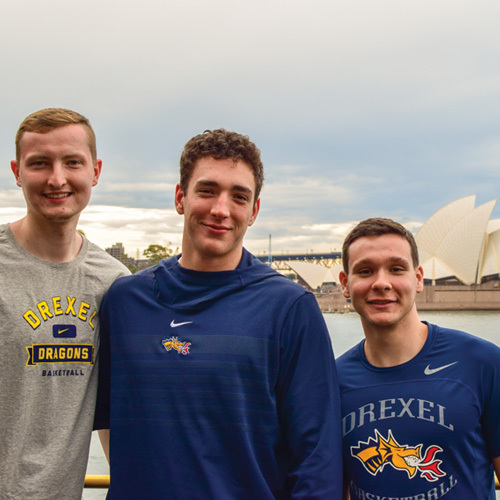 Over the summer, the Drexel men’s basketball team traveled to Australia to test their pre-season skills against four opponents in three cities. 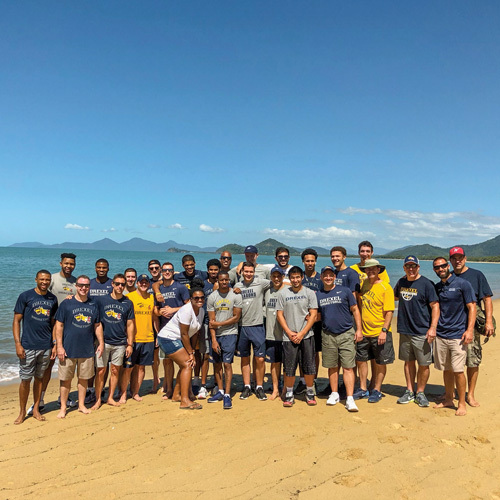 During the 12-day tour, the team soaked up Australia’s natural sites, swam in the Great Barrier Reef, cuddled with koala bears and collected amazing memories. 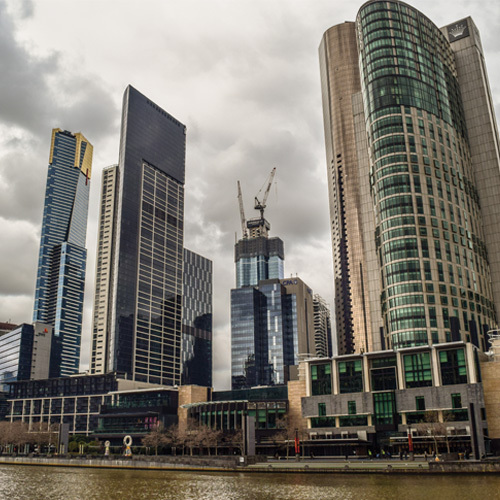 Melbourne (photo 1) is Australia’s second-largest city and one of its most commercial, so there were plenty of cafes and small restaurants to explore in the business district. 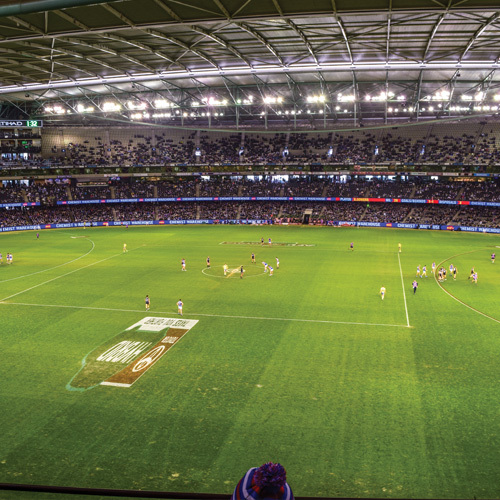 With full stomachs and stretched legs, the team headed to the Ethiad Stadium (Photo 2) to watch Carlton play Western in Australian Rules Football. Day 2 in Melbourne saw the Dragons get back on the court with a morning shootout at a local school. The workout wasn’t easy, as the team was still adjusting to the 14-hour time difference. After getting back to the hotel and getting lunch on their own, the players loaded a bus for Dandenong (Photo 3) to face the Rangers (Photos 4 and 5). The Dragons started off slow against the Rangers and trailed by 12 after a quarter. They fought back in the third quarter (the game was played using FIBA rules) and tied it up at 70, only to have the Rangers score right before the buzzer to take a two-point lead to the fourth quarter. 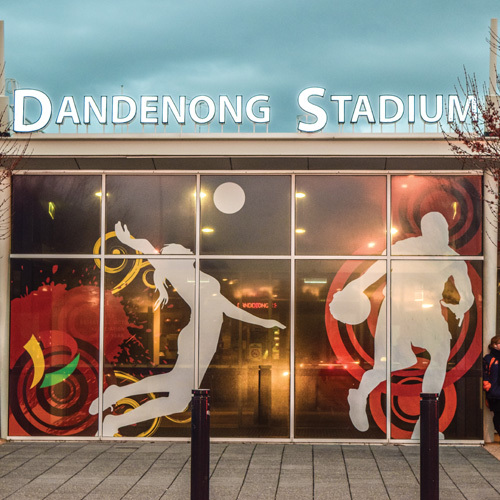 In the fourth quarter, Dandenong went on a big run to start the period and the Dragons would not be able to catch up. The final score was 104-94 in favor of the hosts. There were some bright spots for Drexel in its opener. Despite playing just 36 hours after an all-day trip to get to Australia, Drexel shot 38 percent from deep and 42 percent overall. Zach Walton had an impressive debut, scoring 22 points and making three three-pointers. Troy Harper added 20 points, while Alihan Demir chipped in with 12 points and seven rebounds. First-year players Trevor John (11) and Camren Wynter (10) were also in double figures in scoring. Junior Kurk Lee scored nine points and handed out a team-best eight assists. 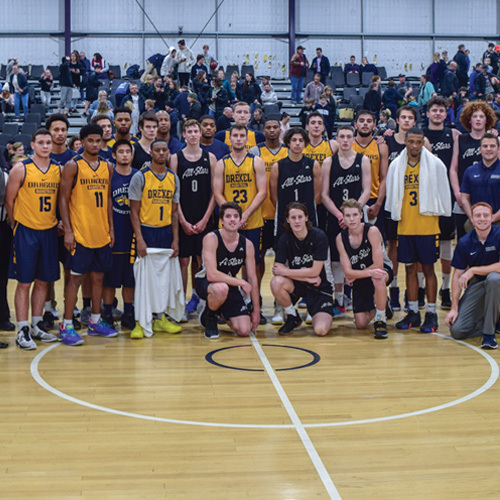 On the Dragon’s final day in Melbourne, Drexel picked up its first win of the trip with an 86-76 win against the 24/7 All-Stars in front of a good crowd just outside of the city (Photo 6). The Dragons rallied after falling behind early and won the game going away. Demir had a huge game for Drexel. The junior scored 27 points, grabbed nine rebounds and handed out seven assists. Walton and Tadas Kararinas each chipped in with 10 points. James Butler came up with 17 rebounds, including nine on the offensive end. The Dragons shot 45 percent from the floor in the game. Earlier in the day, the team took a tram a few blocks away from the hotel and toured Melbourne Cricket Grounds (MCG). The stadium, which holds more than 100,000 for football and as many as 93,000 for cricket, was home to the 1956 Olympic Games. Wednesday was a moving day for the Drexel basketball team. After picking up a win the night before, the team got an early wake up call and headed for the airport to travel to Cairns (Photo 7). This tropical beach town is something to remember. The day started off with a quick breakfast and then a 45-minute drive to Hartley’s Crocodile Adventure (Photos 8 and 9). Hartley’s is more than just your average walking zoo. As soon as you walk in the door, there is a koala habitat with koala bears just feet away. 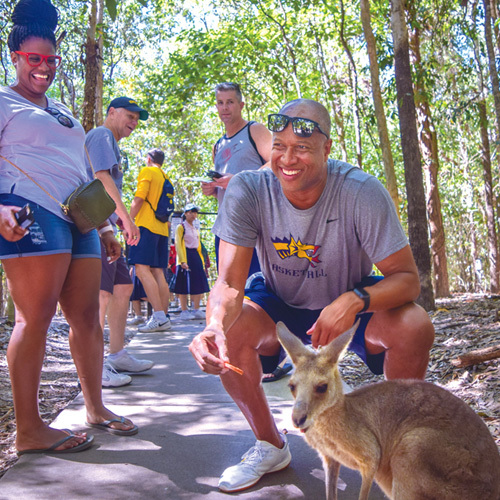 Within 10 minutes of being in the place, Drexel basketball players got a rare opportunity to feed kangaroos and wallabies in their habitat. Australia is known for its deadly snakes and the team saw almost every one of them, including a taipan, cobra, death adder and an enormous python. 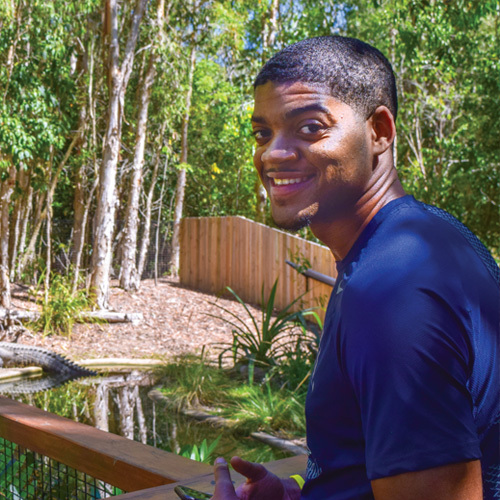 The park had more than 20 crocodiles and they proved to be an impressive sight. A tour guide brought the saltwater crocs over to the side of the boat and they leaped up into the air with massive snapping jaws as the feeder dropped chicken into the water. 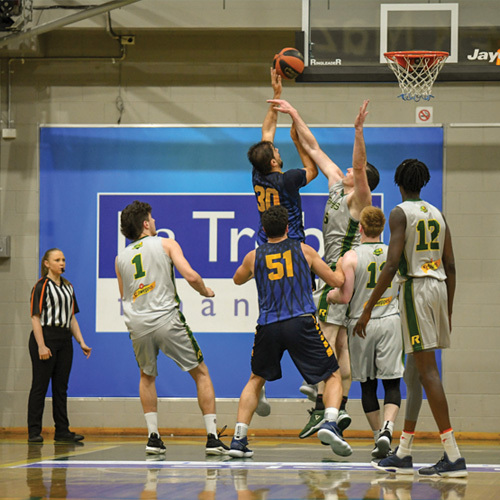 With all of the fun, the Dragons didn’t have a lot of time to get ready for their game against the Cairns Taipans, the evening’s opponent on the court (Photo 10). 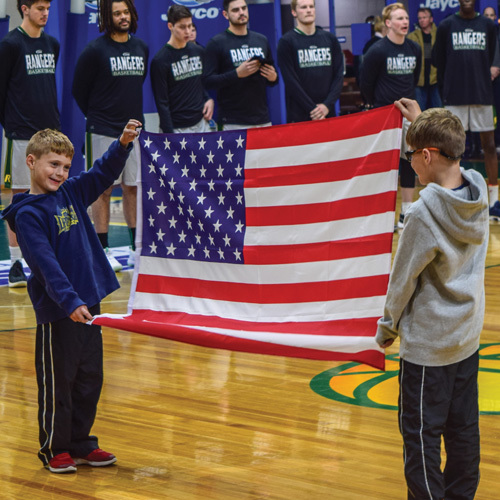 They grabbed a pregame meal and a few hours later were in a small, sold-out gym that was loud and excited to see the local team from the NBL take on Drexel. 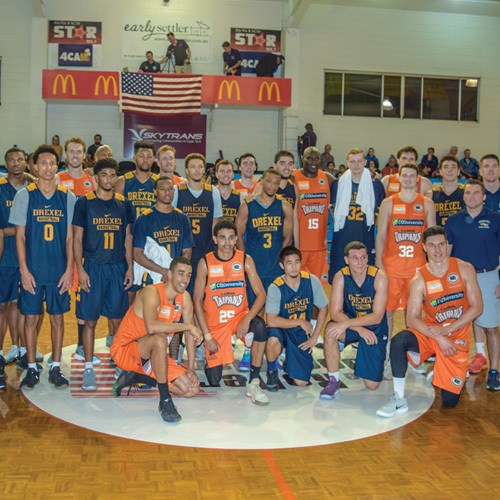 The Taipans play in the top league in the nation. The Taipans jumped out to an early lead, but Drexel fought back and played with intensity that would have made the fans at the DAC proud. Everyone played in the game as the Dragons fell to the Taipans, 92-76. No one was dwelling on their loss to the Taipans the next day when the Dragons took a boat out to the Great Barrier Reef. This enormous coral habitat, one of the world’s seven wonders, is all it is cracked up to be (Photos 11 and 12). The Great Barrier Reef is the only living thing on the planet that is visible from space. It’s jaw dropping. This marine park stretches over 1,800 miles, which is approximately the distance from Philadelphia to Denver. The water is blue and clear down to the bottom. It took more than two hours aboard to get to the reef, yet when we got out in the water and looked down, it was only about 30 yards to the bottom. In other spots, the reef went all the way to the surface. Every member of the team put aside their fears and jumped into the ocean, which is a little warmer than the beaches at the Jersey Shore. 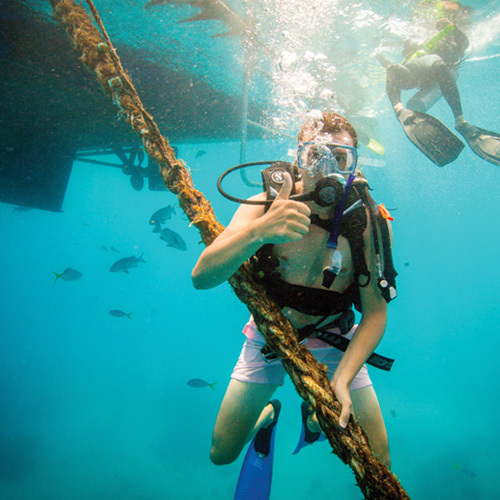 Everyone snorkeled and some even took it to another level by learning how to scuba dive. 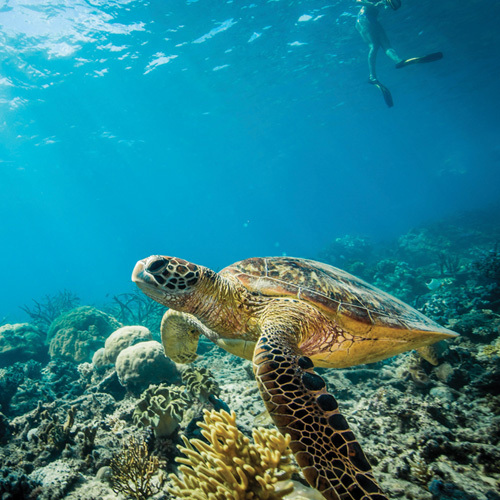 They were able to see amazing coral gardens, tropical fish, giant clams and even sea turtles. 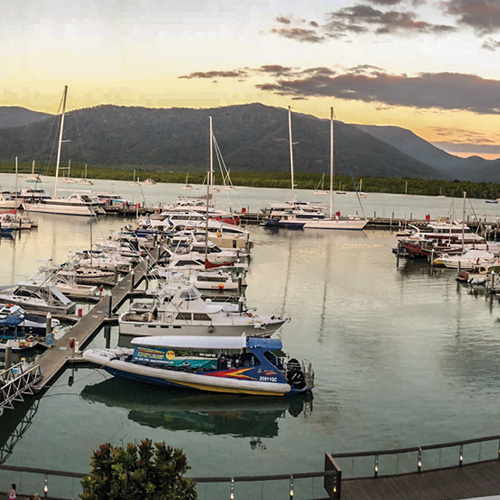 The next day the Dragons hopped aboard a regional plane in Northeast Queensland and touched down about 1,200 miles south in Sydney, the capital of New South Wales. Of course, the team made time for a guided tour of the Sydney Opera House (Photo 13). The next day, the Dragons faced off against the Sydney Kings, probably the best-known team in the NBL. The Dragons got off to a rough start, making just three field goals in the first quarter. The Kings jumped out to a lead and led the entire way, downing the Dragons by a score of 79-52. 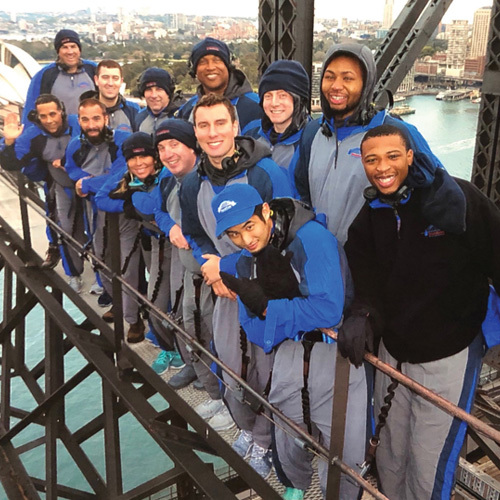 On the final scheduled day of the trip, part of the group braved strong winds to climb to the top of the 1932 landmark Sydney Harbor Bridge for some great views of the city. The vigorous climb was a fitting end to a trip packed with excitement and new experiences from start to finish (Photo 14). The trip gave the Dragons a chance to see what they do right and what they can do better. The coaches saw their players cope with tough competition and come together as a team — all of which gives them a jump on the competition in the 2018–19 season. See the entire journey and more images at http://bit.ly/2NBI2Vg.